There was some bad news for supporters of single-payer healthcare this week: in what he’s calling “one of the most difficult decisions of my public life,” Vermont’s governor Peter Shumlin announced on Wednesday that he was abandoning– at least for now– his plan to enact a single-payer system in the state. Supporters had hoped that Vermont would be a model for the rest of the country, so it’s worth examining what lessons the single-payer movement might take from this setback. Shortly after the ACA passed, Vermont began developing a plan that would meet all of these requirements, called Green Mountain Care (GMC). It’s not true single-payer (which is when everybody is covered by one insurer: the government) but it’s close. State employees, people who get coverage through a small business, and people who buy their own insurance would all now be covered by Green Mountain Care. Vermont also planned to ask the federal government for Medicaid and Medicare waivers– if accepted, people who were enrolled in those programs would now also be covered by GMC. However, those who receive coverage through the military (either the VA or TRICARE), or the federal employee benefits system would keep their old coverage and would not be covered by Vermont’s plan. Employees of large businesses are in kind of a grey area. The 1974 Employee Retirement Income Security Act (ERISA) prevents states from enacting legislation “relating to” employee benefit plans for large employers. ERISA rules mean that Vermont can’t force large employers to participate in Green Mountain Care, but the plan is designed to strongly encourage their participation. GMC would be funded with a tax on all employers in the state– if a large employer opted out, they’d be paying that tax plus whatever they pay for employee benefits; if they opted in, they’d only be paying the tax. Vermont had a solid framework for most of its single-payer system, but still hadn’t figured out the hardest part: how to pay for it. 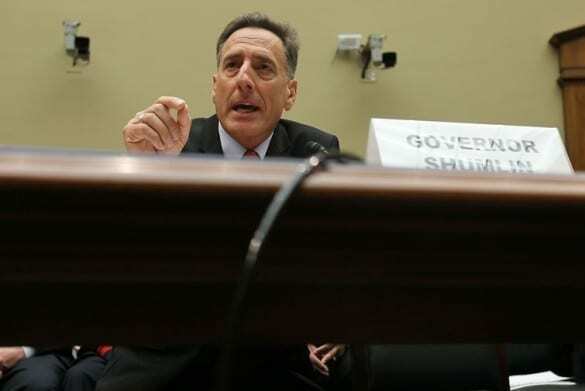 The governor’s team had originally estimated the new system would cost about $2 billion (in a state that currently only collects about $2.7 billion in tax revenue), but at his press conference, Shumlin said that the latest projection was even higher. The new report estimates that Green Mountain Care would cost $2.6 billion in the first year and over $3 billion by the end of the decade. Covering the higher price tag, they say, would require at minimum an 11.5% payroll tax on all employers, plus a new income tax on individuals (which the plan calls an “income based public premium”) on a sliding scale of 0% to 9.5%. If Vermont wanted to phase in the payroll tax for small businesses, the new taxes would be even higher. Also, after just a few years the state would have to find more money somewhere else, since the cost of the plan was expected to grow faster than the revenue those taxes would bring in. After receiving those numbers, I asked my team to reevaluate assumptions and consider policy choices to make the system more affordable, such as eliminating the phase-in for businesses and shifting more of the financing burden to out-of-pocket costs. Both choices had serious problems. The former would cause massive economic pain for many small businesses, likely leading some to close or lay off workers. The latter would require many Vermonters to pay more in out-of-pocket costs than they do now, leaving them with less disposable income. In the end, those choices are not only unacceptable to me; they also only slightly reduce the cost of the financing plan overall. The program would be funded by combining current sources of government health spending (Medicare, Medicaid, etc.) into a single fund with modest new taxes, such as a small payroll tax or earmarked income taxes. While taxes will increase for individual citizens, the increase will be offset by reductions in premiums and out-of-pocket spending. Employees may also receive higher wages from employers, who will no longer have to pay as much for health benefits as part of employee compensation (i.e. instead of paying employees in health benefits, employers will pay higher wages). Sounds easy enough, but when you start to hammer out the specifics you run into problems. For example, say you fund a single-payer system through a simple income tax. Advocates say that tax would be offset by employers offering higher wages– your employer wouldn’t lose any money on the deal, just now whatever money they would have spent on premiums goes into your salary. If we went to single payer, no way does my employer give me a raise equivalent to what they were paying for my health insurance to make up for my new state income tax increase. Give me a big raise they have to pay FICA [Medicare and Social Security payroll taxes] on? F— no, that dough is going right into their pockets. So the tax increase to pay for my new single payer policy is real net money out of my pocket to pay for something I used to get for “free,” and all I get in return is a larger state income tax deduction on my federal return? F—, no! To avoid this scenario– employers simply pocketing money they were spending on healthcare– most single-payer proposals would fund the new system with a combination of income and employer payroll taxes. A payroll tax causes its own problems though. The thinking is that businesses will be able to cover most of the cost of a new payroll tax with the savings from ditching their old private health plans. However, many small businesses don’t provide health benefits. They would have to either (1) absorb a sudden increase in the cost of labor; or (2) cut wages to offset it (or more likely, some combination of the two). How big an issue that is comes down to exact numbers. It could be fine if the payroll tax is moderate and gives small businesses a discount, or at least time to adjust. What Vermont found was that the payroll tax would have to be much larger than they expected, and that was with every business paying it– no exceptions. A phase-in period for small businesses would have meant either an additional 4% payroll tax on other businesses (on top of that 11.5% payroll tax the plan already called for) or dramatically raising the new income tax in the plan. Single-payer activists say fine, just raise income taxes on the wealthy. However, there’s only so far you can go with that on the state level, particularly in a small state like Vermont. If income taxes get too high, rich people can simply relocate across the border to New Hampshire or New York. 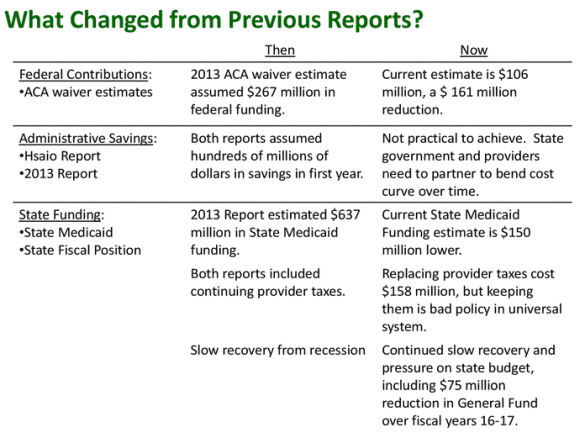 Supporters had expected a smaller tax increase, again because they missed some key details. They had assumed that Green Mountain Care would be cheaper thanks to reduced administrative costs (it’s way more efficient to have one agency with one set of rules processing all claims) and lower payments to providers (similar to how Walmart can pay suppliers less because it’s often the only game in town, a single-payer system that represents everyone can get steeper discounts than a bunch of smaller insurance companies). And it’s true, these features of single-payer probably do save a lot of money… in the long run. However, in the short term, the administrative savings are offset by the cost of getting the new system up and running. And states can’t really slash payments to providers overnight either– that could be a disaster, forcing some doctors and hospitals out of business. Instead the savings comes from slightly reducing payments over time. So part of the transition problem is that most of the savings don’t come until later. None of this is to say that a transition to single-payer is impossible. However, it’s a reminder that even in a best case scenario like Vermont– where traditional opponents of single-payer, like the state’s largest insurer (Blue Cross Blue Shield, which would get the contract to process GMC’s claims) and healthcare providers, are on board, there are plenty of other pitfalls once you propose a specific plan. The single-payer movement has always been a little fuzzy on the details of how it would be paid for and how the transition would work– but if they want to win, it’s crucial to get those details right. I was sorry to learn of this development, but appreciate your analysis. Also, I get your posts at jn12@andrew.cmu.edu. That is an old address and may go away soon. Better switch your list to the address above. Thanks John! And I checked the email list– it says we’re sending whatifpost emails to both addresses. If for some reason our emails aren’t showing up at your preferred address, maybe check your spam folder to make sure they’re not being sent there. Also, you could try resubscribing by entering your email under where it says “Subscribe” on the right sidebar of the What If Post page. Hope that helps! I really liked this post, and your entire blog. Glad I found it. Single payer advocates (whose hearts are in the right place) have been guilty of big generalizations. They ignore the fact that millions of Americans have decent health care and in fact pay very little in premiums: some gov’t employees, some union members, Tricare members, Harvard faculty members, et al. With this group, the taxes they would pay in a single payer system are a LOT higher than the premiums they pay today. Another tricky aspect of any transition is what goes on with spousal coverage. In many families, one spouse gets full family coverage. This enables a second spouse to work at a lower-wage employer who does not offer health coverage. A single payer system would force that low wage employer to offer coverage or pay a tax…..